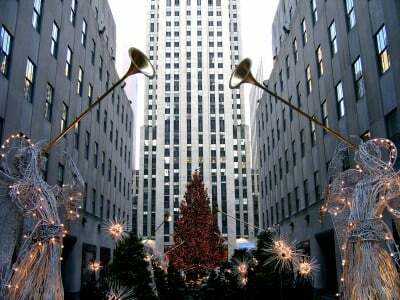 New York: Christmas Eve in The City That Never Sleeps? I pass Symphony Space with its marquee in darkness. Starbucks at 95th is lifeless; although I see lights on atMcDonalds on 96th. Their coffee maker is off; and those employees chatting inside must be waiting to be paid their bonus. (Does McD give Christmas bonuses?). One working mother guarding McD’s door against any new customers unapologetically announces that she’s heading home early today. That’s it. What a reversal of mood since I traveled on this very route only 6 hours earlier! Then, subway platforms on the A-Line were not only jammed with commuters; they thrummed with seasonal music proffered by a variety of ‘holiday’ entertainers who know we’re especially generous these days. A cacophony of sound behind me stirs my curiosity and, walking along the platform, I find its source– a man plucking a guitar and stomping his tambourine-wrapped foot while mouthing some unrecognizable tune. Awful. Yet a surprising number of people stop to photograph his pitiful drama. The man’s disharmony is surely a ploy to draw us to his ‘stage’, a presentation as crude as his music and unarguably below NYC’s street-music standards. There in front of him, and us, five foot-high dolls are perched, each dressed in a colorful bra and skirt. Electrically animated by the man’s vigorous foot slapping, they shake and shimmy, while on a shelf above them, three furry toys– a rabbit, a bear and a monkey– twirl. “Oh look!” squeals a young mother, parking her baby in its stroller. Calling two older children towards the display, the enthusiastically snaps a photo. (Her daughters are less impressed.) Meanwhile passing travelers drop dollar bills into a bowl at the man’s elbow. Others raise their phone cameras towards the makeshift stage, then move on.